Dragon capsule attached to the Canadarm2 floats with the Earth's limb in the background, May 25, 2012. The successful docking of the first commercial spacecraft ever to reach the International Space Station Friday (May 25) is drawing high praise from private spaceflight supporters and space enthusiasts. The unmanned Dragon capsule built by California-based SpaceX arrived at the space station early Friday, with astronauts capturing the gumdrop-shaped spacecraft with a robotic arm and parking it at an open docking port. 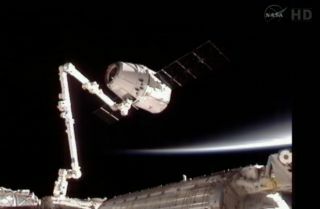 Dragon's arrival at the space station is a major success for SpaceX, which has a $1.6 billion contract with NASA to provide 12 more Dragon flights to the station to deliver vital supplies. But the docking is also a huge step forward for commercial spaceflightin general and the accolades for space industry leaders are pouring in. Today marks another critical step in the future of American spaceflight. Now that a U.S. company has proven its ability to resupply the space station, it opens a new frontier for commercial opportunities in space -- and new job creation opportunities right here in the U.S. By handing off space station transportation to the private sector, NASA is freed up to carry out the really hard work of sending astronauts farther into the solar system than ever before. The Obama Administration has set us on an ambitious path forward and the NASA and SpaceX teams are proving they are up to the task. For the first time, a private American company has successfully launched a spacecraft into orbit and berthed it with the International Space Station--an achievement of historic scientific and technological significance and a key milestone in President Obama's vision for America's continued leadership in space. That is exactly what the President had in mind when he laid out a fresh course for NASA to explore new scientific frontiers and take Americans even deeper into our solar system while relying on private-sector innovators--working in the competitive free market--to ferry astronauts and cargo to low Earth orbit and the International Space Station. It's essential we maintain such competition and fully support this burgeoning and capable industry to get U.S. astronauts back on American launch vehicles as soon as possible. I could not be prouder of our scientists and engineers--both government and private sector employees--who have contributed to this historic mission. A passion for discovery and a sense for adventure have always driven this nation forward, and I join all Americans in watching what future possibilities are enabled by today's great achievement. Heartfelt congratulations to @elonmusk (future SS2 astronaut!) & hardworking teams @SpaceX & @NASA for their historic milestone today! This is truly a momentous accomplishment for SpaceX and for the industry. The capabilities of the commercial space industry grow by the day, and America is well on its way to having a diverse, cost-effective and dependable space transportation system. The entire team at SpaceX should be commended for their commitment and skill, and thanked for their contribution to restoring U.S. access to the Space Station. We saw history made today with the successful arrival of Dragon on Station. We look forward to working with SpaceX to deliver research scientific payloads to the ISS National Lab to further U.S.-based R&D opportunities. If the promise of the International Space Station (ISS) is to be achieved, it is essential that a reliable and cost-effective means to transport cargo to the ISS be available. Today’s successful berthing of SpaceX’s Dragon capsule to the ISS is an important step on the path to demonstrating operational commercial cargo transport support for the ISS. I want to congratulate NASA and SpaceX and their dedicated and talented employees on this significant accomplishment. I wish SpaceX and NASA continued success with this cargo demonstration flight and look forward to the successful return of the unmanned Dragon capsule. I also look forward to Orbital’s own upcoming demonstration flight. Congratulations to both SpaceX and NASA for showing that American ingenuity and innovation are very much alive. The ISS is a unique platform that will help us do the research necessary to enable the next steps in space exploration as well as benefit life here on Earth. But in order to use the ISS, we need reliable cargo transportation to bring supplies and return research samples. Today’s milestone by SpaceX and NASA gives me confidence that such a capability is achievable. This week, SpaceX not only successfully launched the first commercial space transportation vehicle to dock with the International Space Station, but also marked a place in history that will forever be remembered as the true commercialization of space -- the pivotal moment when private industry replaced government to form the new space economy. We salute SpaceX for its groundbreaking accomplishment, and look forward to the innovation and space technology advancements this paradigm shift will enable. It’s not every day you get to witness history in the making. The successful on-orbit rendezvous of the SpaceX Dragon spacecraft with the ISS is a watershed moment for the U.S. commercial spaceflight industry. All of us at Spaceport America salute SpaceX for their groundbreaking achievement. We send our congratulations to Elon Musk and the entire SpaceX team, and wish them continued success of their mission. SpaceX's first Dragon flight to the space station will end on May 31 when the capsule departs the station and splashes down in the Pacific Ocean.